VO Lab is a new app by Sonokids for adolescents and adults who are blind or have low vision. This educational iPad game is designed for students aged 14+ to learn touch gestures and concepts of VoiceOver and VoiceOver gestures, Apple’s built-in screen reader on iOS Devices. The app is both entertaining and educational, and provides beginning learners of VoiceOver with opportunities to gain the required foundation skills to use the iPad or iPhone independently. App is $4.99 on iTunes. Ballyland Magic App is a new, educational and fun iPad game specifically designed for children who are blind or have low vision, to learn and practice touch gestures for VoiceOver, Apple's built in screen reader. Visit http://www.ballyland.com/mobile/ballyland-magic-app.php for more information. Storybud is an online story site, developed by a father with low vision so that he could interact with his children during bedtime story time. Storybud provides the online stories in various formats: audio only; a combined text and audio; or text on the screen only. The site is accessible for persons who are visually impaired using speech software. Visit www.storybud.org for more information. The Center for Parent Information and Resources has an updated fact sheet on children with visual impairment, including blindness. Visit http://www.parentcenterhub.org/repository/specific-disabilities/ to read more. Learning Ally, a nonprofit organization serving 300,000 children and adults across the U.S. who have visual, learning and reading-based disabilities, has transformed its website and launched new features and services to further benefit its members as well as parents and teachers. Parents can check out the more stremlined and user-friendly web site to access the organization's on-line library of more than 75,000 human-narrated audiobooks, including the world's largest library of audio textbooks. VOICEtext, providing sentence-by-sentence highlighting of text on the screen in sync with audio narration. In its initial stages, this feature is being incorporated into a limited selection of titles in Learning Ally's library, will expand into more titles over time, and will benefit individuals for whom a multi-sensory approach to reading is recommended. The Perkins School for the Blind have resources for parent, kids, and teacher that include fiction and non-fiction books and Internet resources. Read more at http://www.perkins.org/history/visit/research-library. Additional teacher resources are located at http://www.perkins.org/elearning. Perkins Scout is a searchable database of carefully evaluated online resources related to blindness and visual impairment. The website mascot, a·dog guide·named Scout, will help you retrieve the information you’re looking for; all of it has been reviewed by Perkins experts and organized for your convenience.·More information is available at http://www.perkinselearning.org/scout. Through the Seedlings Book Angel Program, visually-impaired children can receive two free braille books. Choose from print/braille/picture books, print/braille books, or braille only books. Register online at www.seedlings.org. WonderBaby.org , a project funded by Perkins School for the Blind, is dedicated to helping parents of young children with vision impairments as well as children with multiple disabilities. Much of the content on WonderBaby is provided by parents. They are not just passive observers or consumers of information; many site users comment on articles, answer questions in the Q&A forum, and share hyperlinks to net resources. Some submit original articles. It's in this sharing that WonderBaby earns much of its authenticity. These are real parents with real kids who are blind or visually disabled. They can empathize with other parents seeking answers. Having educated themselves, they feel compelled to give back so that fellow and future parents of children who are blind or visually disabled can also benefit from their experiences. What is Transition Planning? What is an IEP and how can I lead my IEP Meeting? How can I manage my Social Security and medical benefits? How does college differ from high school? How can I obtain services for my disability during college? What resources are available to help me choose the right career? Is there assistive technology available that can help me secure a job? How can I find accessible housing to live on my own? What should I do to prepare for a job interview? While some of the services and resources provided are California state-specific, much of the guidance is applicable to youth in any state. The toolkit was developed with funding from a Medicaid Infrastructure Grant from the Centers for Medicare and Medicaid Services of the U.S. Department of Health and Human Services. To learn more, visit the Youth Transition Toolkit website. Do you want to connect with other parents of a blind or visually impaired child? Check out the American Foundation for the Blind’s “Family Connect” web site at http://www.familyconnect.org/parentsitehome.aspx. Information on numerous subjects of interest to parents, such as IEP’s, toys, eye care, etc. can also be found on this site. The American Printing House for the Blind is seeking applicants for its free print-braille children’s book program, Braille Tales. 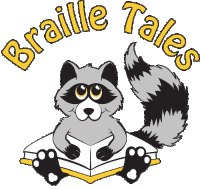 Braille Tales collaborates with the Dolly Parton Imagination Library and the Kentucky Correctional Institute to mail 6 print-braille books a year to families with a child and/or a parent with a visual impairment. Braille Tales is designed specifically for blind preschool children (age 0-5) and their families to foster early literacy and familiarity with braille. The program brings accessible, age-appropriate books into the homes of children who might not otherwise experience braille until they begin school. Hands On! Books for Blind Children is a series of programs for blind children that seek to provide braille books to thousands of blind children and their families throughout every stage of their learning and to provide advocacy and education promoting the benefits of braille. These programs include: Readbooks! Because Braille Matters Family Outreach Program, Bumpy Basics, Children's Braille Book Club, and Lifelong Literacy. Visit the NBP web page for more information about these children’s programs at http://www.nbp.org/ic/nbp/programs/index.html.